Are you struggling with trying to keep your large-breed dog from running off of your property? You can utilize a wireless fence on your spot to keep your dog secure. You’re about to read on five of the best wireless fence options for homes with large dogs to utilize. It is not always easy to ensure that your dog will stay secure and inside your lawn at all times. But the good news is that you’ll have more control over your dog when you have the best wireless fence for large dogs to use. This buying guide will help you recognize what you can do when getting a fence to work for your big furry friend. A wireless dog fence uses a transmitter that links to an electrical outlet. The transmitter will produce a full coverage range based on its setting, position, and any obstructions in the way. This keeps you from having to install wire materials that might wear over time. The dog will wear a receiver on a collar. The receiver will trigger a gentle static shock or vibration when the dog goes beyond the fence boundaries. The design ensures the dog will stay on the property grounds. An audible alert may also sound. Why Use A Wireless Dog Fence ? The design of a wireless dog fence ensures that your dog will stay protected and will not veer off of your property. You can get the fence installed with ease, not to mention it will not look distracting or restrictive like a more traditional fence. Also, the wireless fence does not require you to uproot anything on your lawn. More importantly, the fence is a safe way to keep your dog protected. The lack of a physical fence ensures that the dog will not be hurt by any large objects. More importantly, the static sensations produced by the fence receiver ensure that the dog will not try to run outside of the boundaries too often. Do You Need A Wireless Fence? A wireless fence should be utilized if your dog keeps on straying off of your yard. You’ll also need this fence if you live in a neighborhood where you cannot install a physical fence due to local rules. Are Wireless Dog Fences Humane? A wireless fence is easy to use as it trains your dog to behave properly and to stay in your yard without trying to chase anything. You can remove the receiver when you’re going to take your dog out for a walk or to the park. The fence keeps the dog from straying off without having to use a chain or other physical restraint. You should still see that the receiver you utilize works well enough and that it will not produce lots of pain on the dog’s body when used right. 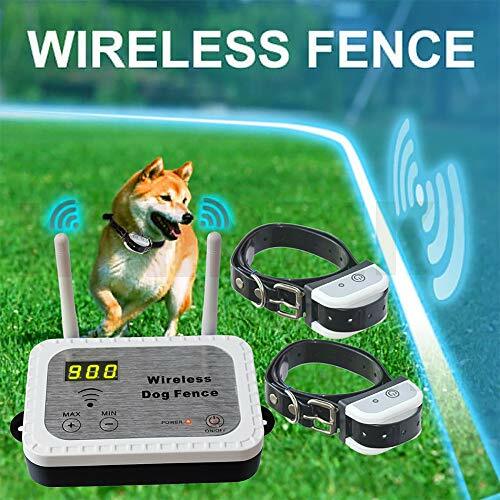 What To Consider When Buying Wireless Dog Fence? You must find a collar and receiver that fits on a large dog’s body. The receiver should handle the neck size without problems. The receiver should also be capable of producing enough of a jolt that your large breed dog can feel. The range on your wireless fence is measured by the amount of distance from the transmitter that the fence can work in. A fence might be capable of operating at up to 100 feet away from the transmitter in any direction, for instance. Check on the size of your yard and see if you can find a safe spot for the transmitter so it will cover the entire space. You may only get one transmitter for your fence in most cases. You would have to plan out the location of that transmitter accordingly. You may also get just one collar with your fence setup, although manufacturers can sell extra collars for other large dogs or as backups. Look at the size of each receiver collar as well. You should be able to adjust the receiver’s fit on your dog’s neck with a small buckle or fastener feature. The receiver should have a battery on the inside that triggers different vibrations or gentle shocks. You can adjust the intensity of the sensation by using a small control on the transmitter or directly on the receiver. An audible alert may also sound in some cases. Review how many correction levels work on your dog fence setup. A small battery should be inside each receiver linked to your fence. The battery may be a small disc-shaped material that should be easy to recharge. A battery can also last for weeks at a time. You should check on whether your receiver features a low-battery indicator or alert that lets you know when you need to switch batteries. Look at how well your receivers can handle water. The design should include a firm body that protects the battery on the inside from water. You should not struggle with getting your fence installed. The transmitter should be easy to set up and power up, although you might not have much control over the shape of the coverage area. You might also have to wait a bit for the desired coverage area to be reached. Power surges or lightning strikes may harm your wireless fence and disable it. See how well your transmitter can handle such issues and if there is a backup power source that can start working if necessary. How Do You Install A Wireless Dog Fence? Review the layout of your property. Analyze any trees, hills, or other surfaces on your property that might influence where your dog can move. Install the transmitter in a central area in your home. This should be at a spot where you have a constant flow of electricity. You might have to mount this on the wall. Keep the transmitter at least two feet off of the ground. Aim for four feet for the best results. Also, the transmitter must be in a dry spot that is also well-ventilated. Test the receiver before having your dog wear it. Check on when the proper alerts are produced and the vibrations are triggered. How Do You Train Your Dog For Using A Wireless Fence? You should train your dog so your pet will respect the wireless fence according to the steps below. Train your dog for about 10 to 15 minutes at a time for the best results. Check on how well the dog can wear the receiver collar and that the unit fits. Set up a series of boundary flags around the fence’s range. Make sure you test the collar to see how well the range works and that you know where to put the flags. Walk your dog along the flags. Allow the dog’s receiver to beep for a few seconds. This lets the dog know it is near the boundary. Help the dog back into your lawn. Give your dog a treat after getting back into the right spot. After a while, train the dog to recognize how the static correction feature works. Let the dog go outside the range for a moment. Allow the dog to then return when it notices the static sensation. Again, provide a treat for when the dog does this right. Test how well your dog can handle distractions. Throw a ball outside the fence area. Give the dog a reward when it does not try going beyond the fence. In order to better understand how to train your dog for your wireless fence, please watch the video below. 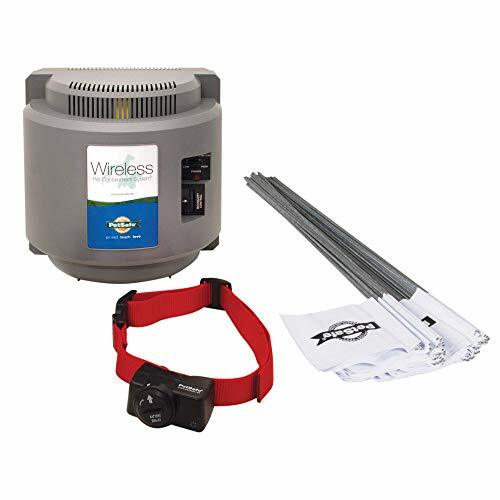 Your first choice for the best wireless fence for large dog use is this PetSafe fence setup. The transmitter can work on any 120V outlet and will produce a containment area that stretches from 90 feet out in all directions. The control setup on the transmitter allows you to adjust the coverage radius from 5 to 90 feet. The receiver uses five static correction levels plus a tone-only option. The smooth contact points on the receiver ensure your dog will feel the static sensations. A few extra contact points work for dogs who have longer or thicker hair. You can order multiple PetSafe receivers and use them on all the large dogs in your home. Fifty boundary flags are included with the wireless fence setup. The flags can be utilized in the training process to help the dog see where it can and cannot go. You will immediately notice a digital display on the transmitter for this set from JUSTPET. The display lets you see how large the coverage range on the transmitter is. Press the plus and minus buttons on the transmitter to adjust the wireless dog fence coverage radius from 10 to 900 feet. The battery on each of the two receivers included will last for 24 hours in a row. You can replace the battery in moments thanks to the simple design interface. A signal light will flash when the battery is running out of power. Switch between ten static or vibration levels, so your larger dog will know when it is getting in the wrong spot. Eight collar contacts are included to cover more places around your dog’s neck. You can also get the collar secured around the large dog’s neck in moments. The buckle-based design ensures the receiver will stay in place. While the ability to adjust the radius coverage of this AngelaKerry wireless fence from 20 to 800 meters is appealing, the GPS design is the most popular point of this model. The GPS signal analyzes where the dog is located when compared with the coverage area you have programmed. This ensures the dog’s specific location within that area is identified, thus keeping the collar from being impacted by obstructions. Two long and short metal contact points are included. These convey the vibrations or shocks produced so a large dog can feel them. You also have three levels of static correction to utilize on this model. The static support makes it so the collar can work on dogs of up to 120 pounds in weight. A 5V USB charging cable comes with the fence setup. The cable helps you to charge up the receiver’s battery. A light will appear to let you know when the receiver needs more power. The most noteworthy feature of this Ellassay pet containment fence is that the receiver can handle up to a hundred static and vibration levels. This means you can test the receiver on your large dog to see how well it can handle the collar. You can also use this at a radius of up to 550 yards. A pulsed stimulus can also be produced based on how far the dog is from your boundary. A series of sounds will be produced when the dog gets close to the edge. Those sounds or pulses will become faster when the dog gets even closer. The design lets the dog know when it is getting too close. You can adjust the radius of the wireless fence through your transmitter. The antenna feature ensures the range will be produced well enough and carried out along the entire yard. The digital display shows the coverage radius as to how many yards are covered. Your last choice for a wireless fence is this model from PetSafe. The design entails a small black transmitter that could fit in the palm of your hand. But this transmitter also produces a powerful range of up to 105 feet from the unit. The Stay + Play works at spaces where there is at least 45 feet of land that can be covered and where a consistent power outlet can be utilized. You could bring this to a local park if desired. The small control knob on the transmitter lets you change the coverage range on the fly, although it takes a bit for the unit to respond. The PetSafe receiver works with five levels of correction. A tone-only option works for training purposes. The collar charges up in about two to three hours on average. Expect the battery life to last for about two to three weeks on a single charge based on regular use. Also, the adjustable design works for large dogs with neck sizes up to 28 inches. 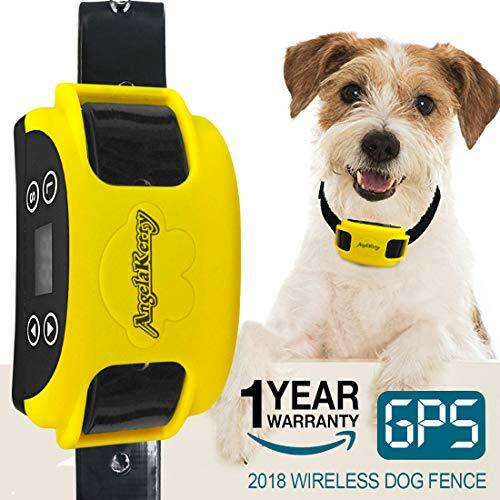 Each of these options for the best wireless fence for large dog use is helpful, but the proper choice to utilize here is the Justpet Wireless Electric Dog Fence Pet Containment System. This model includes an extensive range and an easy to program interface. The collar is easy for the dog to wear. You can also adjust the buckle on that receiver in moments. 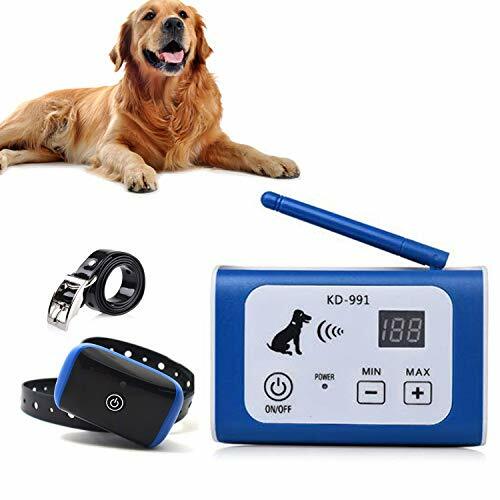 The Justpet model comes with an easy to use transmitter with a sturdy and consistent connection. The alerts produced by the collar also keep the dog from moving out of a space. 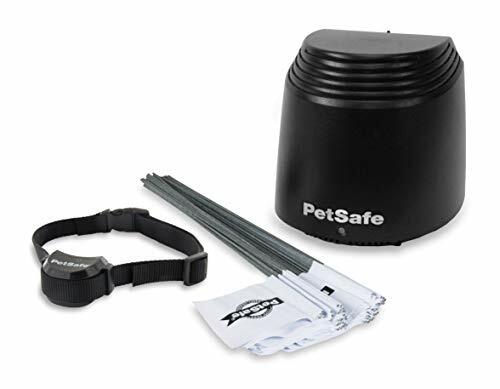 The design ensures your dog will stay safe in your yard and will not go off your property.